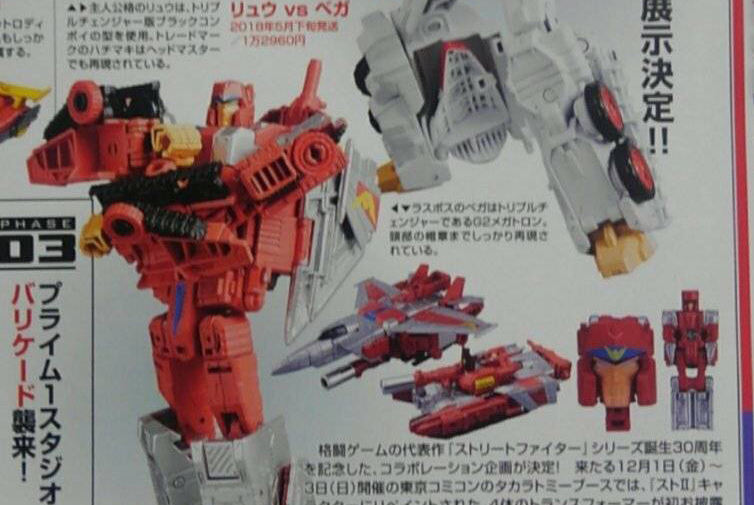 Takara: Transformers/Street Fighter Crossover Figures … What? Posted by Jon in Street Fighter, Takara, Transformers with 0 comments. Well this is certainly something I never thought I’d see. In fact I’d go as far as to say it’s something that I would have never even thought of. But now that I know it exists, I need it! So Takara will be releasing Transformer two-packs with each character’s color scheme matching a different Street Fighter character. Not only that, but the Titan Masters will actually be molded to look like their specific fighter. Chun-Li (Generations Arcee, the only non Titans Return figure) and Ken (Titans Return Hot Rod) which should cost around 8,000 YEN. As I mentioned previously, Chun-Li uses the older Generations Arcee body. Which drives me slightly crazy because she doesn’t get a Titan Master. However, I get it because they wanted to use the curvy legs from the Generations mold.